When I was a kid, I loved jets. Like most boys, I seemed to love vehicles of all sorts. That all waned as I got older, but fast fighter jets are pretty impressive machine…even if the US Navy’s Blue Angels make my blood boil with their noise, and when I think that my tax dollars pay for all that jet fuel in their F/A-18 Hornets. Nevertheless, as an audio recordist, jet fly-bys aren’t that easy to get on cue. 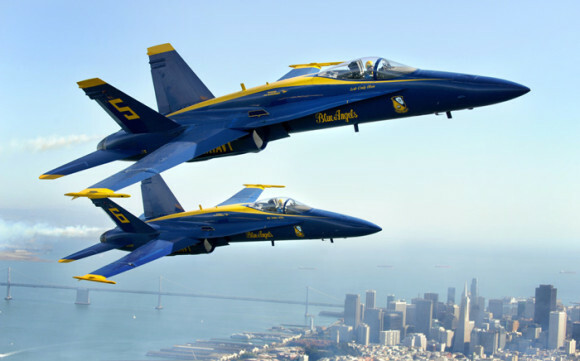 So, every year, I try to record the Blue Angels over San Francisco during Fleet Week. I always say I’ll go somewhere and record them, but life gets in the way on the weekends. But Thursday and Friday beforehand, they do practice runs over the city. I planned to go onto the roof of my workplace, but a bunch of tech hipsters got there first: Too much talking and reaction sounds. So I just stuck my Sony PCM-D50 out the window, in a small channel between skyscrapers. When these things scream by, I was measuring between 40dB and 50dB over the background noise level…which, in an urban area is already between 40 and 70dBA. The PCM-D50 has pretty bad limiting – it actually is always recording at two different levels, and fades between the two, so it’s not even a real limiter. So you need to set your levels very carefully. I did a test on Thursday to get just two fly-bys on Friday that were relatively clean.